Siem Reap is the land of religious belief where you can get away from the bustling cities and seek original values in its diversified culture, stunning ancient architecture, and mouth-watering dishes. As soon as you take a day tour or short excursion in Siem Reap, feast your eyes with the overwhelming sight of the massive Angkor Temple complex and feel the warm smile on local people’s faces, you will be impressed by the city’s beguiling charm and its otherworldly appearance. Siem Reap has so much more to offer other than the famous Angkor Temple complex. At Go Cambodia Tours, a Siem Reap day tour or excursion will take you around the city to engage in interesting outdoor activities, enjoy delicious Khmer cuisine, and marvel at impressive natural sceneries. 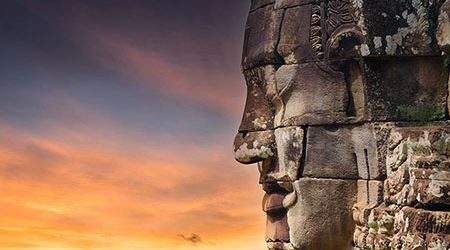 Keeping you busy and entertained from morning till late afternoon, our recommended list of Siem Reap tours & day trips 2019 include many of the lesser-known and quieter sights around the city. We also deliver various ways of immersing yourself in the local culture, from exploring traditional dances to practicing weaving, fishing, and farming in old-fashioned ways. Contact us now and let us know the ideas for your Siem Reap tours. We will customize a perfect Cambodia tour package that suits your every need! Located in northwestern Cambodia, Siem Reap is the main tourist attraction in Cambodia thanks to its location near the Angkor complex. However, besides the famous Angkor, Siem Reap also attracts visitors with many interesting activities. Read on our recommended fascinating activities for your upcoming Siem Reap tours & day trips. Angkor Wat is a symbol of Cambodia. Angkor Wat worshiping Vishnu is the best-preserved temple in the area and still remains the center of religion. Angkor Wat is a really beautiful landscape, your tours to Siem Reap should not miss some temples located further in the archeological park. 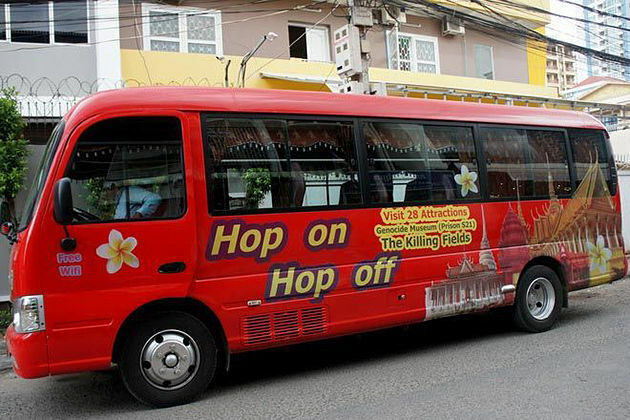 The fare for a day of sightseeing is $ 20, three days is $ 40 and one week is $ 60. Angkor Thom temple with wide walls covers the Bayon Temple. 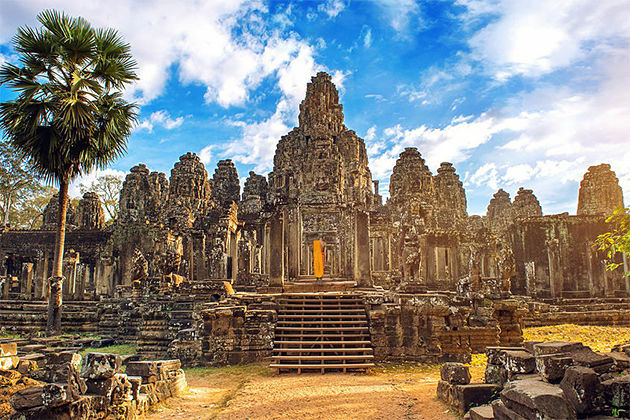 Bayon Temple is paved with 216 reliefs, creating a complex like a maze. Ta Prohm is covered by crumbling ancient roots. It is also one of the most exotic and unique structures of the Angkor complex. Going further, Preah Khan Temple and Banteay Srei are shady trees and there are still many elaborate carvings. Phrom Kulen National Park in Kbal Spean, a two-hour drive from Siem Reap, still carries ancient stone carvings known as lingas. Linga River - the sacred river of Cambodia is an indispensable tourist destination in the Siem Reap tour. This river is separated by the jungle, the riverbed is sculptured with many Linga symbols, along the trails visitors will find the precipitous staircase waterfalls. This is an option for you when visiting Angkor. Contemplate the panoramic of Angkor complex from above by hot air balloon, especially at sunrise or sunset is a very interesting experience. The higher you are, the more grandeur Angkor is, and of course, do not forget to take a few photos to save memories. The vast Tonle Sap Lake has been recognized by UNESCO as a biosphere reserve filled with aquatic organisms. Spend some days in your Siem Reap tours to take a traditional boat trip through the colorful floating villages is an opportunity to return to nature and explore daily life in Cambodia. Do not hesitate to jump off the boat and kayak through the hyacinth and blue umbrellas in the pristine forest of Kompong Phluk to experience the rare feeling of excitement. There is a place in Siem Reap where serious activities are being taken, to preserve and restore the ancient Khmer arts and crafts, and at the same time, create a means of making a living for local people. It is Artisans d'Angkor's - a social enterprise, specializing in providing high-quality products such as handmade clothing, lacquerware, silk painting, jewelry and pottery by more than 1,300 local artisans. You can book free guided Siem Reap tours & day trips in seven languages to the main shops, as well as to the Angkor Silk Farm by fast bus in just 20 minutes and free of charge. Tuk-tuk is a very popular transportation in Siem Reap. You can take this vehicle to visit Siem Reap and the motorists can become tour guides for you. Another interesting experience for your Siem Reap Tours is horse riding to explore the tranquil and peacful beauty of the countryside. The ideal address for you is Happy Ranch. Siem Reap is proud of its delicious food, which is no less than anywhere else in the world. A single day tour or trip in Siem Reap could not be completed without trying the Khmer specialties such as red ants and fried spiders in the Marum restaurant. You should also visit Cuisine Wat Damnak restaurant to taste the specialties of Cambodian cuisine through the skill of chef Joannès Rivière. A glass of lavender martinis at the Miss Wong restaurant, inspired by Shanghai opium or Femme Fatale cocktails at the Raffles Grand Hotel d'Angkor, inspired by Jacqueline Kennedy's 1967 visit, is also worth to try. Pub Street is considered as a Western Quarter in Siem Reap with a row of bustling restaurants and bars. Most of the bars are open all day but they only operate from 5 pm until midnight and even throughout the night. Enjoying Angkor Beer is an experience you should try in your Siem Reap tours. If you do not like the bustle of the bars and want to enjoy a delicious cocktail, go to Miss Wong Restaurant. In Siem Reap, visitors can try pottery at the Khmer Pottery Arts Center. Most of the products are made by skilled craftsmen and local craftsmen. In Siem Reap, in the evening, you can go for a massage, especially foot massage by fishes at many shops near the side of the road for $ 5 - $ 10. At night, to end up a day tour or short excursion in Siem Reap, you can relax by buying a circus ticket at Phare - a famous circus in Siem Reap. Phare shows often feature a combination of traditional and modern culture, suitable for both children and adults. Cambodia is famous for its sacred temples and pagodas. When traveling to Cambodia, maybe the first place that most people think of is Angkor Wat complex. Angkor Wat complex is located in Siem Reap city - a city northwest of Cambodia. What is the best time to visit Angkor Wat also Siem Reap? As a city located in the northwest of Cambodia, Siem Reap has the same weather and climate as other cities in Southeast Asia. Weather in Siem Reap is tropical and is divided into 2 distinct seasons: the dry season and the rainy season. Tourists often travel to Siem Reap in the dry season, but if you have the Siem Reap tour in the rainy season, it is also a fascinating experience, because in the rainy season the famous tourist attractions such as Angkor Wat became very mystery. The dry season lasts from November to April next year. The weather is dry, sunny, warm and humid. Temperatures in this season range from 25 to 35 degrees Celsius. The best time to visit Angkor Wat is in the winter - from early December to late January. In winter, the sky is clear, the temperature is not too cold. It is also the best time to enjoy the sunrise and sunset in Angkor. April - the month the Khmer people celebrate the New Year is also the hottest month of the year. In this month, the highest temperature can reach up to 35 degrees C. In the dry season, Siem Reap almost had very little rain. During the rainy season or the wet season, from May to late October, there may be heavy rain. At the beginning of the rainy season, it is quite hot but it rains mostly late in the afternoon or early in the morning. This is also the beginning of the rice growing season. In June, July, and August, it is cooler and rain will fall in the evening and at night. September and October are the dampest months of the year. It may rain at any time but do not worry about it when visiting Siem Reap, remember to prepare the umbrella in case of rain. During this time, the landscapes are very peaceful. October is really the best month for photographers. When having a tour to Siem Reap, do not worry about any natural disasters. This city is well protected from tropical storms and no earthquakes occur. The only thing that can interrupt your vacation is that the town may be flooded. The river flows through the center of Siem Reap city and may overflow in September or October. Floods in Siem Reap are not only caused by heavy rainfall but also by water from the surrounding area and from Phnom Kulen flowing into the Tonle Sap. Siem Reap, like Cambodia, has experienced the most devastating floods in recent 50 years in 2011. The floods have destroyed many rice fields, roads, houses, and other buildings. River expansion and improvements in the drainage system are ongoing. Do not let this prevent you from visiting Siem Reap during the rainy season. Try walking through the water, watching the children play in the rain, which can be a nice memory when traveling to Siem Reap. What time is best to travel to Siem Reap? Weather in Siem Reap is pleasant to travel around the year. • January, October, November, and December are the most beautiful months to visit Siem Reap. • In May, June, July, August, September, 10, it rains a lot. • In January, February, and December, the weather is dry. • January is the driest month. • April has the hottest weather. • In September, it rains the most. Avoid this month if you do not like too much rain or floods. Theravada Buddhism is the official religion of Cambodia, and it has remained so since the 13th century (barring the period of Khmer Rouge). Theravada Buddhism accounts for about 95% of the population. However, people from other religious faiths such as Hinduism, Islam, and Christianity also reside here. The locals of Cambodia prefer to dress modestly. Men prefer wearing shirts and long trousers. Women are often seen in knee-high skirts, sarongs, and blouses instead of t-shirts. Due to the social and economic diversity of the population of Siem Reap province, it is possible to have very different experiences of Cambodian life and the attitude of Cambodian people. Visitors to Siem Reap can be overwhelmed by a large amount of tuk-tuk. In fact, the Cambodian people are very honest and hospitable. 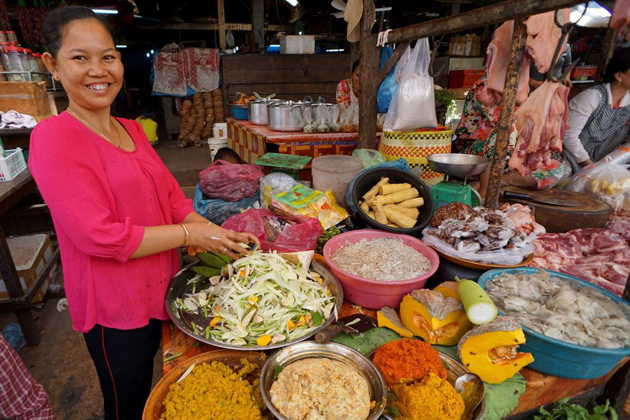 Many Cambodians are willing to share with visitors about their food, language, culture, and customs because they understand that Cambodian culture is not well-known in the same way as in other countries, and so the majority of visitors will never experience it outside of Cambodia. Perhaps due to the country's dark ages under the Khmer Rouge regime, nowadays, Cambodians are trying very hard to preserve the cultural traditions that were almost eliminated during the Khmer Rouge. They are also very proud of the cultural heritage of their country. Any visitor who has the good fortune to be invited to a family visit, for food, or perhaps even a wedding should make the most of the opportunity and be treated as the guest of honor. Old Market or Psah Chas Market is located between Pub Street and Siem Reap River. This market offers tourist attractions such as souvenirs and many other local products. Other markets in Siem Reap include Angkor Night Market, Sivutha Street, Phsar Kandal (Central Market) located on Sivutha Street, which serves tourists, and Phsar Leu (The Upper Market) located further along the 6 Highway but is the largest market of Siem Reap used by locals. The Made in Cambodia Market (formerly known as "Well Made in Cambodia") is a night market for tourists in Siem Reap, where all the products sold should be made in Cambodia. The market organizes daily shows and other events on King's Road. Most bars and pubs in Siem Reap are concentrated on a strip called Pub Street and it's the alleys around. Despite the tranquility of the day, the streets of Pub Street, just a stroll from the historic Psah Chas (Old Market), come alive at night with light and music. Tourists, both at home and abroad, start in the bars and pubs and enjoy the lively atmosphere at night. Started in the late 90's by a local business called Angkor What? Bar and its next service is its rival, Temple Bar, from across the street, Pub Street is often considered a must-see attraction in Siem Reap. Siem Riep is 7 km from Angkor International Airport (IATA code REP) and can be reached by direct flights from many Asian cities, by land from Phnom Penh and the border from Thailand. It can also be reached by boat (via Tonle Sap Lake) and buses from Phnom Penh and Battambang. It is possible to go from Bangkok to Siem Reap via Poipet. The road from Poipet to Siem Reap is paved and sealed in 2013. If you take a taxi from Bangkok to Poipet and from Poipet to Siem Reap, you can complete the entire journey within 6-10 hours. , depending on time across the border. This journey is also possible by bus and minibus. Tickets can be purchased online through Nattakan's official website. Getting to Siem Reap from Bangkok is also possible by a train passing Aranyaprathet Station to the Cambodian border and then through the minibus or general taxi to Siem Reap. Walking around Siem Reap is easy because it is a small city, so most of the landscapes are very close to being able to move to. The easiest way to explore every corner of Siem Reap is by walking. There are also other transportation options such as tuk-tuks, taxis, motorbikes, and bicycles. These vehicles are everywhere at cheap rates. The medium and luxurious hotels here also offer to pick up and drop off services at Siem Reap International Airport. Angkor Archaeological Park is 6 km from Siem Reap city center. You can walk, use the bike or use the tram to explore the famous Angkor complex. Traveling with the remork, also known as the tuk-tuk, is the most common way in Siem Reap, especially for groups of more than two people because each remork can carry up to four people. Tuk-tuk is simply a trailer attached to a motorcycle. Price per trip is calculated by time and distance traveled. This is a very economical option for catching a tuk-tuk from the airport to Siem Reap, which costs about $ 5. A short tour to visit the Siem Reap city costs from $ 1 to $ 3. But tuk-tuk prices to visit Angkor Archaeological Park in a day is 40 dollars. The tuk-tuk drivers speak English very well, they can even be a tour guide for you. Moto, also known as a motorbike taxi, can be found throughout Siem Reap's famous restaurants, hotels, and attractions. The driver cannot speak English fluently so you should prepare a list of destinations written on paper so that they can be read and taken to your destination. Short tours to Siem Reap city center cost $ 1, but tours of Angkor Archaeological Park, Prasat Banteay Srei or Tonle Sap are more expensive. Before departure, you should negotiate a price with the driver. Traveling by bike in Siem Reap is an environmentally friendly option and is also very cost-effective to travel. Because renting a bike is just $ 1 a day. Many hotels and guest houses provide bicycles for free. In addition, along with the Old Market and Wat Bo Road, there are many cheap bike rental shops. The rent price for a typical bicycle is $ 1 to $ 3, while the rent for a mountain bike is $ 10. A not-for-profit organization called White Bicycle offers 50 bikes for some hotels and inns. You can rent them for $ 2 a day. 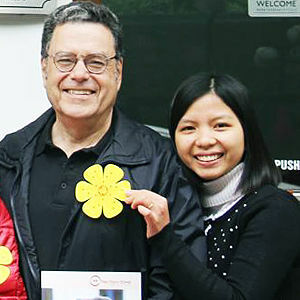 The proceeds are used to invest in clean water projects and scholarships for local children. Electric vehicles are an environmentally friendly option for visiting Siem Reap city or surrounding areas. These vehicles use solar energy to operate and can easily move on land roads. One of the Blue-Mobility rental company that rents electric vehicles for $ 60 for an Angkor Wat tour and $ 90 for a tour of Prasat Banteay Srei, Phnom Penh. Kulen, Beng Melea, and Tonle Sap Lake. The driver can speak English. For trips over 10h, you will have to pay an additional fee of $ 10. Taxis in Siem Reap are not as popular as tuk-tuks or trams. There is no official taxi company. That's just one of the jobs of the local drivers. As a result, the cost of taxi services is not fixed. The only fixed taxi service is from the airport to Siem Reap. It costs $ 7. The price for each tour around Siem Reap is about 25-30 dollars, the price per tour around Angkor Wat is 40 dollars, the price per tour to the distant temples like Banteay Srei is 50 dollars. Telephone / Fax / Internet in Siem Reap (National code +855, city code 63). International call rates are $ 3 per minute, a local call is 500 riel per minute, a domestic call is $ 1 per minute. Internet stores usually have cheap VoIP calling. All post offices, hotels, most internet salons and many guest houses offer international telephone service. The internet in Siem Reap is fast, cheap and there are plenty of cafes or internet shops. Access price is about 0.5 USD / h. Many hotels also have internet service, some are free for guests, but most are priced very high, several times at internet salons. Siem Reap Central Post Office is located on Pokambor Boulevard (west of the bank), 500 meters from the roundabout, open from 07h00 to 17h30. Providing communication services as well as postal matters and parcels. Cambodian stamps can be found here. - The hotel is not responsible for the valuable things, money in the hotel room without sending at the reception. - For your passport, important papers, cash and other personal property of great value, always carry your belongings in the hotel room in case of theft. - When traveling by bus, pay attention to money and important documents, passport. Be careful of the theft when sleeping on the bus. - The store of money change is filled up on Pub street so you can go round and see what store is ok, choose it for money change. Choose those stores are not in the corner but in the main street. - Money should be changed bit by bit, do not change all of your money. And remember, when you go shopping, ask for Riel's price, because the dollar price is usually rounded up so they can profit. How Many Days Should You Spend on an Angkor Tour? - You should travel to Angkor Wat in the early morning to avoid harsh sunshine at noon, moreover, in the morning, the scenery of the Angkor complex is usually more beautiful. - Pay attention to keep the ticket, it helps you move easily to the attractions in the relic. - In Angkor Wat, many people pretend to be charities or money collectors to preserve the temple. You should not give money to these people. - Beggars in the monuments are very popular, you should pay attention to this issue. - Should bring some kind of itch treatment because the Angkor Wat area has a lot of mosquitoes.